In popular imagination, London is a city of fog. The classic London fogs, the thick yellow “pea-soupers,” were born in the industrial age of the early nineteenth century. The first globally notorious instance of air pollution, they remained a constant feature of cold, windless winter days until clean air legislation in the 1960s brought about their demise. Christine L. Corton tells the story of these epic London fogs, their dangers and beauty, and their lasting effects on our culture and imagination. As the city grew, smoke from millions of domestic fires, combined with industrial emissions and naturally occurring mists, seeped into homes, shops, and public buildings in dark yellow clouds of water droplets, soot, and sulphur dioxide. The fogs were sometimes so thick that people could not see their own feet. By the time London’s fogs lifted in the second half of the twentieth century, they had changed urban life. Fogs had created worlds of anonymity that shaped social relations, providing a cover for crime, and blurring moral and social boundaries. They had been a gift to writers, appearing famously in the works of Charles Dickens, Henry James, Oscar Wilde, Robert Louis Stevenson, Joseph Conrad, and T. S. Eliot. Whistler and Monet painted London fogs with a fascination other artists reserved for the clear light of the Mediterranean. 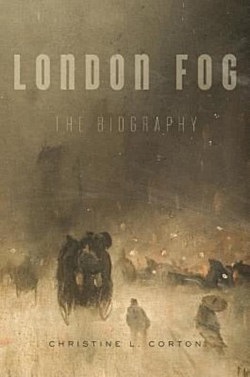 Corton combines historical and literary sensitivity with an eye for visual drama—generously illustrated here—to reveal London fog as one of the great urban spectacles of the industrial age. Christine L. Corton is a Senior Member of Wolfson College, Cambridge, and a freelance writer. She worked for many years at publishing houses in London.